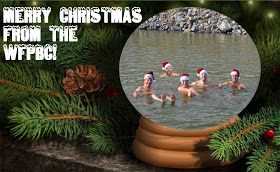 Utah Open Water: Merry Christmas From WFPBC! I was planning on doing two cold water swims today, but couldn't make it down to Provo this morning to meet up with Nate. I wish I had, there was ice in the water! I met Gordon, Jim and Alan at the GSL marina this afternoon for our last swim before Christmas. It was a pretty nice day today. The air temp was around 46 and the water temp was right around 39 to 40 degrees. After snapping a few photos in our Santa hats, we got in the water. There was a crowd of people who had gathered to see what was going on. Jim said one of them put a single finger in the water to see how cold it was. What people don't realize is that it actually gets better after a couple minutes in the water. We took some more photos and then swam out to the rocks and back. On the way out we saw some GSL friends heading out of the marina to go sailing. On the way back, some duck hunters were coming back in on their boat. They were bundled up as much as they could be and thought we were totally nuts for being in the water. We talked and joked with them for a while on the way back to the ramp. Jim, Alan and I ended up staying in for just under 15 minutes. The recovery was really good for me today. Maybe because it was relatively warm outside. Jim said it was much easier for him as well. I asked Alan if he was coming to the New Year's race and he hadn't heard about it. I told him to check out the WFPBC website for the details. He could do it no problem. We sure missed having Goody the Ice Man there with us today. Gordon went ahead and added him in to this awesome Christmas card. Hopefully Goody will be well enough to take a dip on New Year's. Merry Christmas from Utah Open Water! I am looking forward to another exciting year of swimming and hope you will come and join us. Coldest Swim of the Year so Far! 47ish Degrees and Three New Polar Bears.